Did you ever wonder what maintenance on a certified aircraft you could (or could not do) as a non certificated airframe and powerplant mechanic or repairmen pilot? FAR Part 43 specifies who may do what to an aircraft in the way of maintenance, repair or alteration. It requires that only properly certified mechanics work on aircraft and authorize them for return to service. • Removal, installation, and repair of landing gear tires. • Replacing elastic shock absorber cords on landing gear. 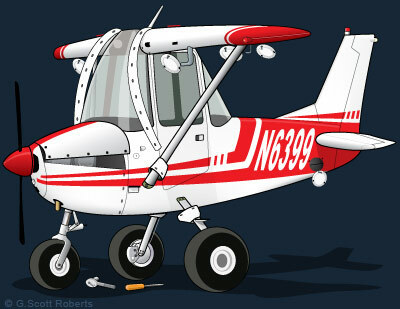 • Servicing landing gear shock struts by adding oil, air, or both. • Servicing landing gear wheel bearings, such as cleaning and greasing. • Replacing defective safety wiring or cotter keys. • Lubrication not requiring disassembly other than removal of nonstructural items such as cover plates, cowlings, and fairings. • Making simple fabric patches not requiring rib stitching or the removal of structural parts or control surfaces. In the case of balloons, the making of small fabric repairs to envelopes (as defined in, and in accordance with, the balloon manufacturer's instructions) not requiring load tape repair or replacement. • Replenishing hydraulic fluid in the hydraulic reservoir. • Refinishing decorative coating of fuselage, balloon baskets, wing tail group surfaces (excluding balanced control surfaces), fairings, cowlings, landing gear, cabin, or cockpit interior when removal or disassembly of any primary structure or operating system is not required. • Applying preservative or protective material to components where no disassembly of any primary structure or operating system is involved and where such coating is not prohibited or is not contrary to good practices. • Repairing upholstery and decorative furnishings of the cabin, cockpit, or balloon basket interior when the repairing does not require disassembly of any primary structure or operating system or interfere with an operating system or affect the primary structure of the aircraft. • Making small simple repairs to fairings, nonstructural cover plates, cowlings, and small patches and reinforcements not changing the contour so as to interfere with proper air flow. • Replacing side windows where that work does not interfere with the structure or any operating system such as controls, electrical equipment, etc. • Replacing seats or seat parts with replacement parts approved for the aircraft, not involving disassembly of any primary structure or operating system. • Trouble shooting and repairing broken circuits in landing light wiring circuits. • Replacing bulbs, reflectors, and lenses of position and landing lights. • Replacing wheels and skis where no weight and balance computation is involved. • Replacing any cowling not requiring removal of the propeller or disconnection of flight controls. • Replacing or cleaning spark plugs and setting of spark plug gap clearance. • Replacing any hose connection except hydraulic connections. • Replacing prefabricated fuel lines. • Cleaning or replacing fuel and oil strainers or filter elements. • Replacing and servicing batteries. • Cleaning of balloon burner pilot and main nozzles in accordance with the balloon manufacturer's instructions. • Replacement or adjustment of nonstructural standard fasteners incidental to operations. • The interchange of balloon baskets and burners on envelopes when the basket or burner is designated as interchangeable in the balloon type certificate data and the baskets and burners are specifically designed for quick removal and installation. • The installations of anti-misfueling devices to reduce the diameter of fuel tank filler openings provided the specific device has been made a part of the aircraft type certificate data by the aircraft manufacturer, the aircraft manufacturer has provided FAA-approved instructions for installation of the specific device, and installation does not involve the disassembly of the existing tank filler opening. • Removing, checking, and replacing magnetic chip detectors. (3) issued by another entity that has a course approved by the Administrator; and The inspections and maintenance tasks are performed in accordance with instructions contained by the special inspection and preventive maintenance program approved as part of the aircraft's type design or supplemental type design. • Removing and replacing self-contained, front instrument panel-mounted navigation and communication devices that employ tray-mounted connectors that connect the unit when the unit is installed into the instrument panel, (excluding automatic flight control systems, transponders, and microwave frequency distance measuring equipment (DME). The approved unit must be designed to be readily and repeatedly removed and replaced, and pertinent instructions must be provided. Prior to the unit's intended use, an operational check must be performed in accordance with the applicable sections of part 91. • Updating self-contained, front instrument panel-mounted Air Traffic Control (ATC) navigational software data bases (excluding those of automatic flight control systems, transponders, and microwave frequency distance measuring equipment (DME)) provided no disassembly of the unit is required and pertinent instructions are provided. Prior to the unit's intended use, an operational check must be performed in accordance with applicable sections of part 91. Of course all maintenance actions, including preventive maintenance performed by the certified pilot, must be recorded in the aircraft maintenance records.